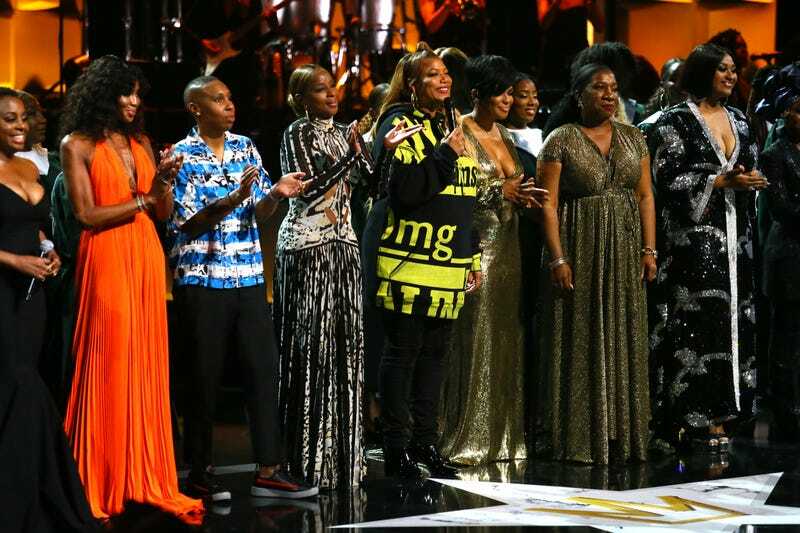 (L-R) Ledisi, Naomi Campbell, Lena Waithe, Mary J. Blige, Queen Latifah, Beverly Bond, Tarana Burke and Jazmine Sullivan onstage during the Black Girls Rock! 2018 Show at NJPAC on August 26, 2018 in Newark, New Jersey. “Tonight’s honorees represent our radiance and our royalty … Thank you all for showing the world how bright we shine and how hard we rock,” said Black Girls Rock! founder Beverly Bond, speaking to the audience at the New Jersey Performing Arts Center during the Black Girls Rock! Awards, which aired on BET on Sunday night. “Collectively, you all represent why black girls rock,” host Queen Latifah told the honorees, each of whom had major words of inspiration to share with those of us watching. We encourage you to print them out, post them on your mirror, or tattoo them on your arm, as needed. Writer, producer and actress Waithe, sporting a kiss print from Ava DuVernay, who presented Waithe her “Shot Caller” award, thanked Bond and Black Girls Rock! “for reminding folks that gay black girls rock, too.” Using her recently cropped hair as a metaphor for freedom, she encouraged us all to “get free,” by whatever means necessary. #MeToo Movement founder Tarana Burke, honored with the “Community Change Agent” award, wanted to ensure that the Black Girls Rock! audience continues to claim a movement that was initially created for them, imploring black women not to be discouraged by the mainstream adoption of #MeToo. Mary J. Blige’s acceptance speech was a testament to her own evolution, and to the fact that she has indeed been growing up beside us, “singing [our] lives with her songs,” as presenter Phylicia Rashad (obviously a huge MJB fan) proclaimed as she brought Blige to the stage to accept her “Star Power” award. “Know always that you don’t get there by yourself. You are constantly lifted by trailblazers and mentors. … Please remember that you wear a crown,” she said. Janet Jackson doesn’t need a “Rockstar” award to affirm her iconic status; her over 40 years in the entertainment industry speak for themselves—as did the cheers of “Janet! Janet! Janet!” that rose from the Black Girls Rock! audience when she appeared to accept her award. But Jackson made sure to give credit to the women who rocked before her, calling out Nina Simone, Gladys Knight, Patti LaBelle, Aretha Franklin and her fellow honorees, among others. Jackson’s words were perfectly applicable to the many dynamic performers at the ceremony, including Fantasia, who opened the show with the first of several musical tributes to Aretha Franklin, H.E.R., Victory and Tamia, who all turned in lovely performances, and Rapsody, who broke a rhyme scheme down to its roots, reminding us that hip hop is pure poetry. But hands-down, the most incredible music of the evening came via a flawless medley of Aretha songs performed by Jazmine Sullivan, Ledisi, Cynthia Erivo, Stephanie Mills and Yolanda Adams, backed by Kim Burse and the Black Girls Rock! band. Watching each blaze through some of Franklin’s most beloved songs, it was hard not to hope the powers that be might reconsider the casting of Franklin’s biopic. No shade to the mega-talented Jennifer Hudson, but remember that biopic of Bob Dylan that featured six incarnations of the singer? Aretha deserves at least that many.